Check trail conditions before you ski! We will update trail conditions throughout the winter on our SkinnySki page. ​Today, March 11th, is our last day of ski rental. Please feel free to come out with your own skis as long as we have snow! Let it snow! Skiing and snowshoeing are wonderful ways to experience the snow during the winter season and get the benefits of fresh air and exercise! Enjoy the Nature Center’s groomed trails, then relax with hot chocolate, tea, or coffee (available for a 50¢ donation) inside the Interpretive Center. THANK YOU to Belita Schindler for the generous donation, in memory of Dr. Richard Schindler, of $5.00 for each child’s rental during this winter ski season, which reduces the rental fee for children to $1.00 each. 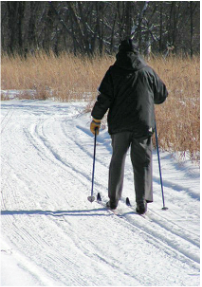 We will again be offering FREE cross country ski and snowshoe rental for adults and children on Thursday afternoons from 3:00 to 6:00 p.m. beginning December 13, 2018, and continuing into March if snow conditions allow. The Jay C. Hormel Nature Center does NOT REQUIRE the Minnesota Ski Pass on our trails. Children 18 & Under – Cross Country Ski or Snowshoe Rental: $1.00! *Skis need to be returned 15 minutes before closing time.